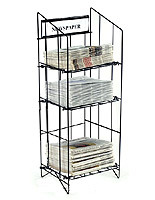 This Newspaper Rack with Durable Metal Fabrication is Finished in Black! The Subtle Color of the Stand Matches Any Environment! 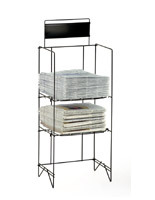 Choose the Newspaper Rack that is Right for Your Store Right Now! 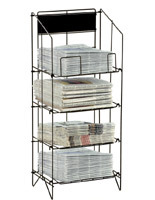 This affordable newspaper rack is designed to fit store tabloid sized papers. 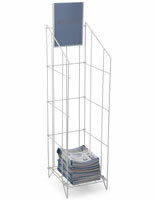 The holder is fabricated from quality metal that is finished in a gloss black powder coat. 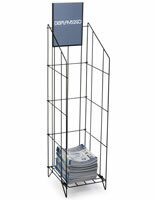 Each newspaper rack features (3) shelves, which allow users to advertise multiple publishers at one time. 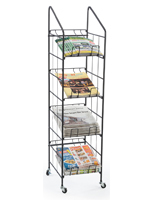 The newspaper rack is frequently set up in grocery markets, corner stores, and many other local businesses. Add one to any establishment to distribute free or priced papers. 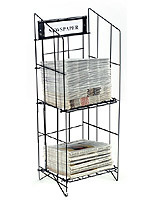 At the top of the newspaper rack, there is a metal sign plate with matching black finish. This channel is designed to hold a 11" x 4-1/4" printed card or label. 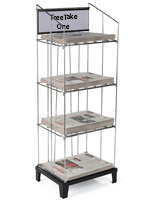 This way, customers know exactly what is for sale on the newspaper rack. In addition, the overall look of the store will be tidier and more organized, which encourages customers to come back again. 12.3" x 43.0" x 16.0"